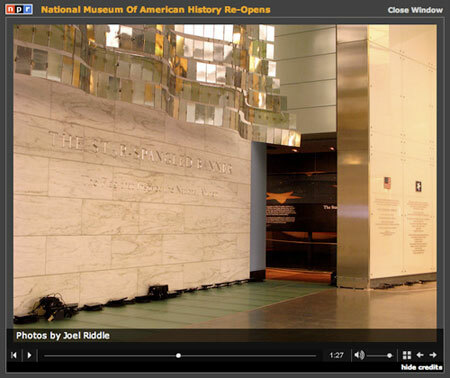 NPR has posted an online audio slideshow about the opening of the National Museum of American History. The last half of the piece (1:25 mark) is an extended tour of the "heart of the museum", the Star-Spangled Banner exhibit. The report is by NPR's very excellent Susan Stamberg with great photography by Joel Riddle. See the entire slideshow here .